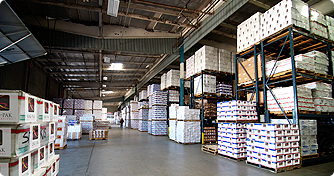 King-Pak’s state of the art facility has various storage capabilities including, frozen, refrigerated , and dry. 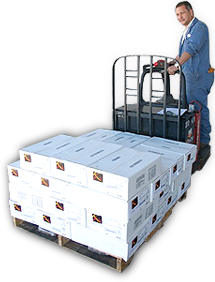 Electronic inventory and bar-coding system insures accuracy in completing your order. 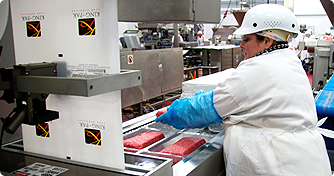 Partnership in our meat processing plant provides the best selection and quality to which our customers have grown accustomed. Our knowledgeable and caring staff is at your service. 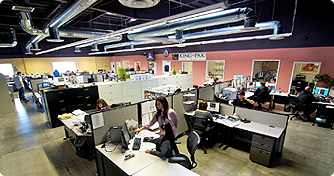 King-Pak is committed to your business! 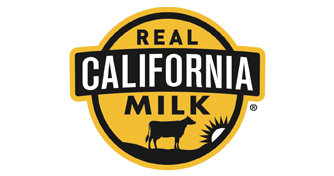 King-Pak Food Services delivers dairy products made with REAL California Milk and REAL California Cheese, helping to make your menus delicious. Happy Cooking! 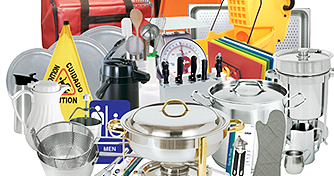 King-Pak Food Services offers the widest selection of Professional Kitchen Smallware Supplies, Kitchen Equipment. The expertise of a knowledgeable Specialist will assist you with your questions, or planning of equipment upgrades, replacements or additions. Let King-Pak be your "One Stop Place to Shop!" 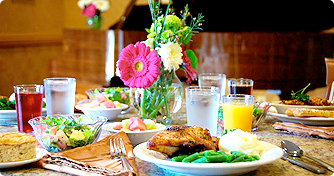 King-Pak Food Services has been serving the Healthcare Industry since 1969. We are a multi-generational company committed to making a difference in your healthcare dietary programs. Caring about your business is the driving force that has forged our successful growth. Our "hands on" philosophy caters to each customer with their special needs and defines King-Pak as an industry leader. We have expanded our distribution area to include Northern and Southern California, Nevada and Arizona. Our warehouse utilizes state of the art scanning equipment for inventory accuracy. We have added equipment, supplies and janitorial which truly categorizes King-Pak as a Broadline Distributor. LOOKING FOR QUALITY PRODUCTS THAT KEEP YOU IN BUDGET, HELP EASE THE BURDEN OF HANDLING RAW MEAT AND POULTRY ITEMS IN THE KITCHEN, AND OFFER 100% YIELD RIGHT OUT OF THE PACKAGE??? KING-PAK Food Services NOW PROUDLY OFFERS our Delicious new Innovative line of "SERVICE READY" Products. Features and Benefits for this delectable product line-up are: Quality, Consistency, NO "Cool Down" Required!! !, Warm in Cook Bag in Boiling Water ... or Heat with Natural Juices in an Oven Pan. Products are in stock now. Place your order today!!! On-Line Ordering is now available for your added convenience.